Or: How a little contest can become a very important fixture in your Sumo life. But let's start from the beginning: At the end of 2000 the internet contained only few information about Sumo, even if you knew Japanese. The average Western fan did know that there are more divisions that Makuuchi and Juryo, but had no idea how to get just the results of them, let alone more background data. So one brave man wrote a little script that could translate the Kana on the Japanese pages into Roman letters. Now everyone could follow the success of rikishi in Makushita, Sandanme, Jonidan and Jonokuchi. Soon there was created the Adopt-a-Jonidan-Rikishi Contest. Who would pick the fastest riser to the Makuuchi division? We took the fifth division, as Jonokuchi rikishi are too prone to retire. The "official" game part ended with the announcement of the Aki Basho 2006 banzuke; Hochiyama was promoted to M14w. "Is there an adopt a makushita rikishi scheme too?" What a great start for my parentage! My first letter to him seemingly hadn't arrived. But the following ones would! He sometimes even answers with a little present like a banzuke or the Takanohana-beya Inauguration Booklet. 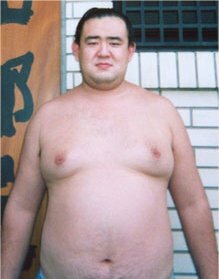 The story ended on 2008 Aug 17, when he finally retired after doing Sumo for 16 years. Good luck for your future, Suzunohana-san!